Welcome to our daily brokerage currency review, our team of analysts will provide real-time encryption market updates at the start of the New York market (9:30 am EST), we encourage readers to provide feedback and try out our encrypted trading platform ICO168.io, you can trade BTC, ETH, LTC, XRP, and more on the ICO168.io platform coming soon. As you can see on Bitcoin’s 4-hour chart we have just bounced off the 78.6% Fibonacci line of $6357. Bitcoin has dropped 10% since yesterday, so a retracement upwards should be likely. However, if we break support here the next test of support will be $5777. Right now, our short-term resistance is $6812. This was actually our support yesterday but now it is $6357. Mid-term resistance is $7132. 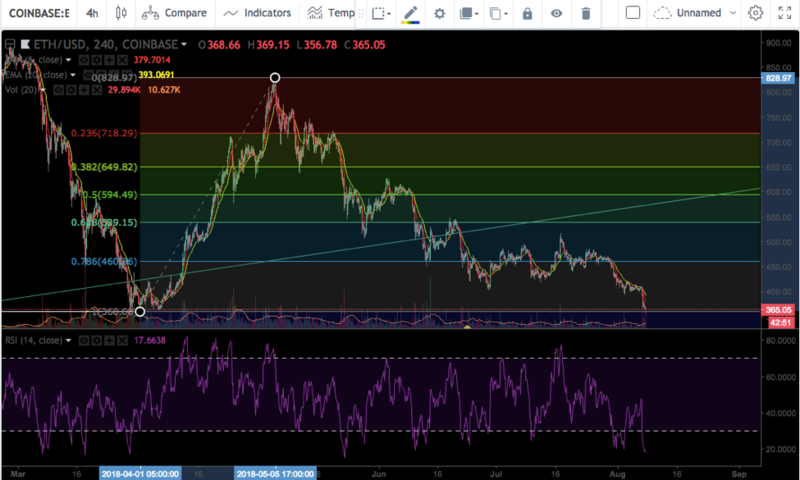 Ethereum has retraced 100% now. Currently, Ethereum is trading at $365 and tested a new low for the year when it hit $356. 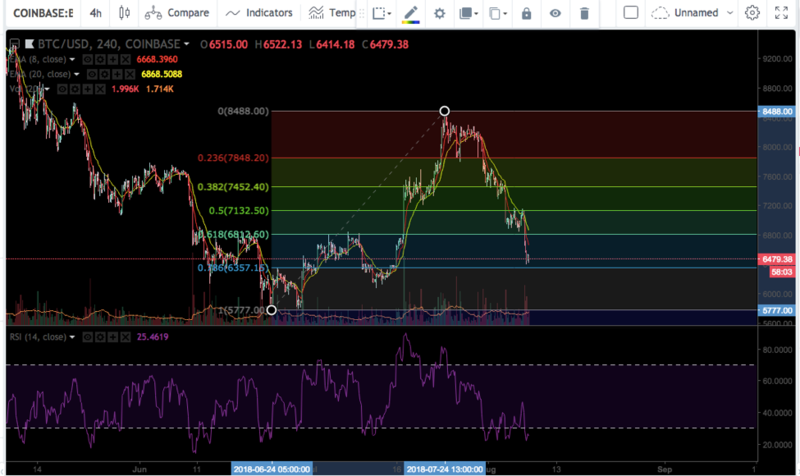 RSI shows that it’s very oversold right now so a bounce back is expected, but the trend is very bearish now. MACD has not shown signs of a bullish reversal yet either. Major level of resistance now is $460, with our last level of support now at $356. Litecoin has not seen this price since November and has not found support. The price hit $62.50 on heavy sell pressure and MACD is still moving downwards with no reversal apparent yet. Key resistance is $70.10 and support isn’t apparent but the low of $62.50 is what is holding up the price right now. 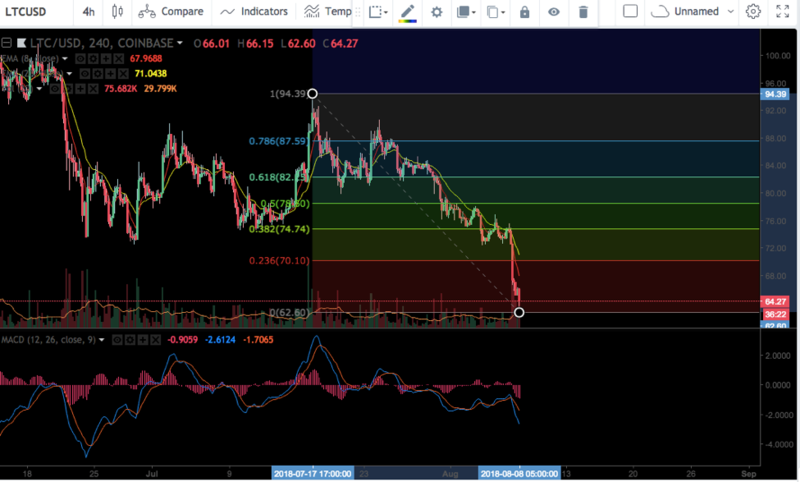 Major resistance that Litecoin needs to test is at the 38.2% Fibonacci line of $74.74. Ripple has also hit a low not seen since December 12th, 2017. There hasn’t been support established right now as XRP has been freefalling since July 18thby almost 40%. XRP needs to will need to get back into the trading range of $.42 to $.50 where it was trading at for almost a month. 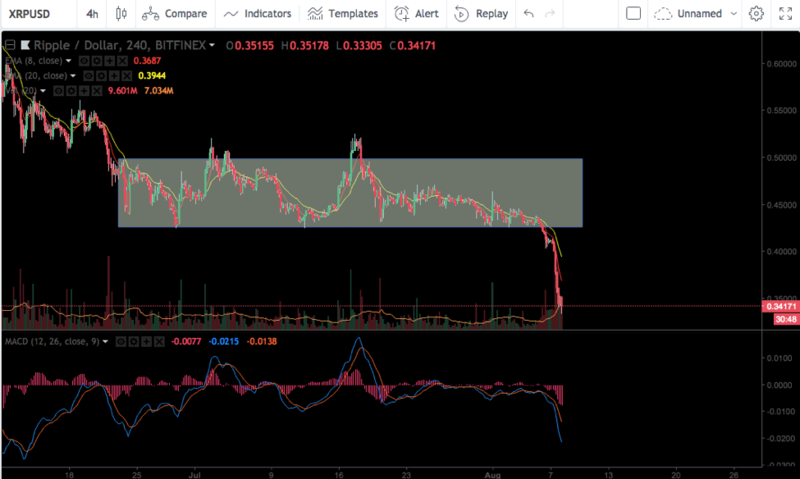 Previous major support was and resistance was this range but now XRP is trading at $.34. A lot has happened in the past week that has greatly affected all cryptocurrency prices. The most important news that caused the whole market to crash 8% since yesterday and 23% in 3 weeks was the CBOE Bitcoin ETF decision. Yesterday, there was an announcement that the SEC was going to postpone the deadline on making a decision. However, there may be subsequent deadlines in the months to come as they won’t have to make a final decision until February or March of 2019. 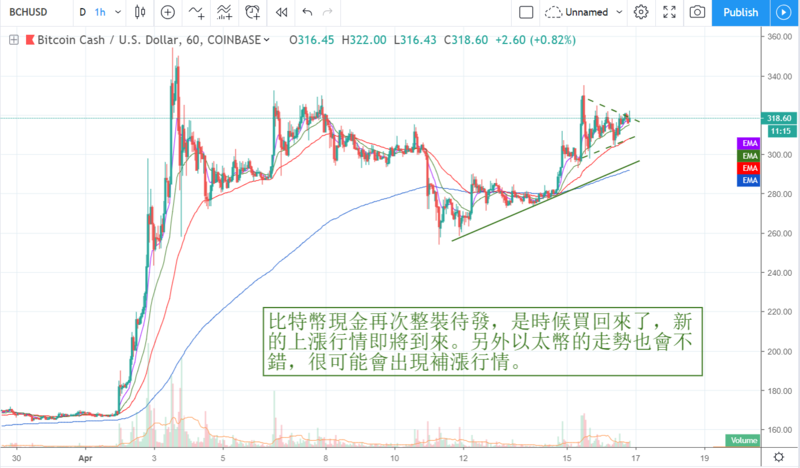 Most of cryptocurrency prices recently have been pegged upon the approval of this ETF for institutional investors to enter this space. That being said, the parent company of the NYSE, ICE had also announced its future support of digital assets and payment channels for retail merchants last Friday. This is actually good news but it is not enough to hold up this market. We have now hit year lows for most cryptocurrency coins.